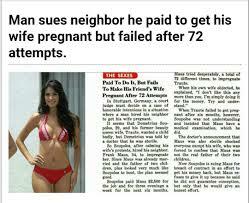 A 29 year old German man Demetrius Soupolos is suing his neighbour 34 year old Frank Maus for breach of contract after the latter failed to impregnate his wife in 72 different attempts to do so. Soupolos paid Maus Sh260,000 for the job and for three evenings a week for the next six months, Maus tried desperately a total of 72 times to impregnate Traute. Thanks for sharing this joke Mike. Please keep them coming, it is always difficult to get good jokes.